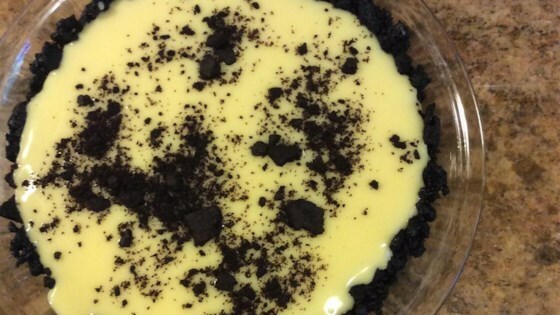 "Made with instant vanilla pudding in a chocolate crust with crushed chocolate wafer cookies. For a special treat, drizzle the pie with chocolate syrup before serving." Whip cream and vanilla together until soft peaks form. Fold whipped cream into vanilla pudding mixture. Mix in crushed chocolate wafers. Pour mixture into prepared pie shell. Chill for 1 hour. Just before serving, drizzle with chocolate syrup, if desired. This recipe tasted good, but the pie didn't hold together. It turned into mush as soon as you cut into it. Not good for company. Maybe you need to use cooked pudding instead.